Harvard student Alexis Hartford tests the Harvard Yard Archaeology Project app. The app will let users “see” where various objects were discovered during Yard excavations. The trenches have been hard to miss. Dug nearly every other year since 2005 between the trees and pathways crossing venerable Harvard Yard, these excavations have begun to offer insight into its history. Next September, when work begins again, visitors will have a new tool with which to peek into the past: an augmented-reality app that will re-create these excavations and shed light on some of their more interesting finds. A collaboration among Harvard’s Peabody Museum, Cambridge startup Archimedes Digital, and the digital scholarship support group made up of representatives from academic technology, the Harvard Library, and the History Department, the app — simply called the Harvard Yard Archaeology Project, for now — will make its public debut next fall. Because the dig will resume again as the fall fieldwork for the Archaeology 1130, “The Archaeology of Harvard Yard,” the timing will allow insight into an ongoing project, along with a deeper understanding of the discoveries from digs in fall 2005, 2007, 2009, 2011, 2014, and 2016. The yearlong course focuses on lab work involving the finds during the ensuing spring semester. Although each year’s excavation site moves slightly within the Yard, the app will provide access to previous years’ work. 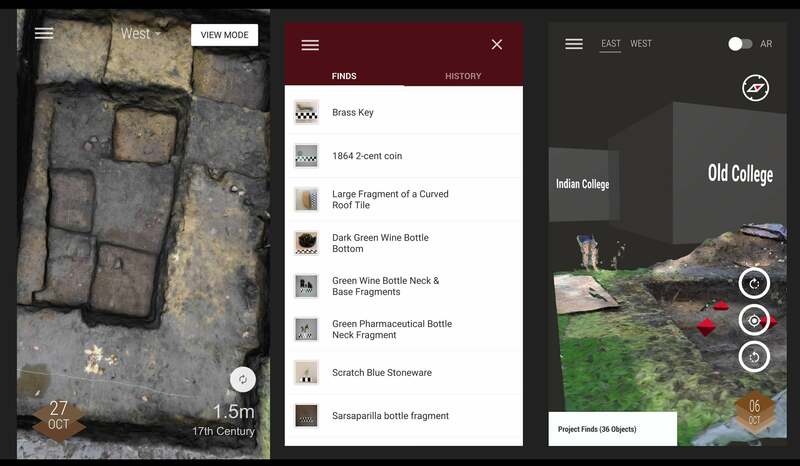 With GPS to guide users to the precise location of each trench and 3-D overlays to virtually visualize what lay within, the app will let users “see” where various objects were discovered, complete with information about the strata of the dig where the object was found, and its importance. The app, now in its beta or testing mode, will give users access to the object biographies of select pieces, along with essays and maps that trace the likely history of objects, as well as their social or cultural meaning. These range from tobacco pipes and wine bottles — there was “an unbelievable amount of smoking and drinking on campus,” said Peabody Museum curator Diana Loren, one of the course’s instructors — to bits of type. Sourced from the first printing press in the British colonies, Loren (who shares teaching duties with co-curator Patricia Capone) said the type “was used to print religious texts in the Algonquin language to facilitate conversion” of those Native Americans. Since 2008, “Digging Veritas,” an exhibit at the Peabody Museum, has been introducing viewers to many of these newfound treasures. With the app, all that information will be immediately available and, perhaps most noteworthy, accessible at the very sites where the discoveries were made. The public can experience an augmented reality “excavation” with the app, guided by Harvard graduate student Alexis Hartford, during the Amazing Archaeology Fair at Harvard on March 24. Julius Wade (right) and fellow PfoHo residents celebrate being the second to arrive at the John Harvard statue for the annual delivery of housing assignments.